Whether you’re pushing the limits on that stretch of open road, or taking corners with ease, Ford Taurus is the full-size sedan experience you’re looking for. With a choice of engines, you’ve got as much power as you care to possess. Stay poised through the corners, even when accelerating, with Torque Vectoring Control.3 The system applies a slight braking force to the inside front wheel, as needed, to help more torque reach the road and to help keep Taurus firmly planted. APPEAL TO YOUR SENSES. The soft-touch surfaces in this meticulously assembled interior feature finely stitched seats and eye-catching accents. Cooled, power-adjustable front seats, power-adjustable pedals and power sideview mirrors are standard on Limited and SHO, and include a memory setting to make life even more convenient. Our next generation of voice-activated technology with a new, easy-to-use design and features. The easy-to-read color LCD touchscreen displays phone, audio and navigation functions. High-speed performance lets you experience quick responses to your commands. A capacitive touchscreen includes a convenient swipe feature similar to your smartphone, as well as pinchto- zoom functionality within navigation.Search for points of interest to help you locate restaurants, nearest ATMs and more. 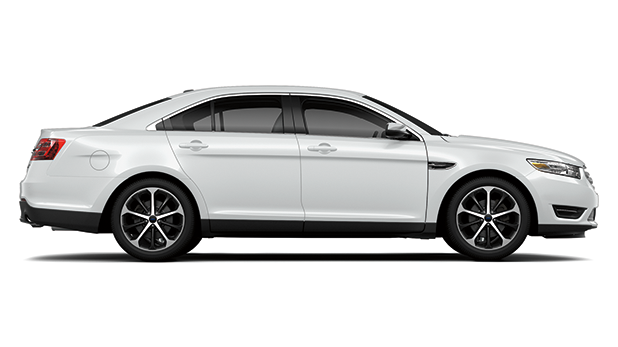 After just one use of its active park assist,1 you’ll never go back to parking Taurus the old way. Whether you’re backing into a perpendicular spot or slowing down to parallel park, ultrasonic sensors can identify a parking space that is the right size, then the system steers the vehicle into it. All you do is follow on-screen prompts, and operate the accelerator, brake and gear shifter as needed. Park like a professional. Every time. Go from 0-60 mph in 5.5 seconds. Hit the quarter-mile in 14.4 seconds. The Super High Output Taurus boasts seating for 5 and power to spare, with 370 net PS, thanks to the twin-turbocharged V6 EcoBoost engine. The tighter, sport-tuned suspension adds a true performance feel for both the driver and passengers alike. And when you want to shift it into “Sport Mode,” the standard 6-speed SelectShift® transmission truly accommodates. At the touch of a button, the programmed shift points change to provide a sporty response that’s designed to thrill. Some features referenced may be optional extras at additional cost. Models shown are for illustrative purposes.